Should I Go for Full Ordination? I wanted to ask you about gelongma (bhikshuni) vows. I ordained as a novice two years ago, and a year ago, I asked my teacher, Geshe Jampa Gyatso about taking bhikshuni ordination. He responded, “Not yet.” He told me to talk to nuns who have taken it, to ask questions, and to think about it for a few years. So I’m now slowly beginning to contact some bhikshunis and to find out more. I hope you don’t mind sharing your thoughts with me. How does it work, on a practical level-preparing for the ordination, taking it, and afterwards? I feel a little hesitant taking vows in another tradition, one that I know nothing about. How do you bridge between the two traditions? Do you remain part of the Tibetan, or are you then part of both? Who is your abbot afterwards? It feels difficult, almost self-defeating, if my abbot will be someone I may never meet again in this life. I think it would be best to learn the language and the context well before taking the vows, and to stay with a community who keeps them for a while at least, but I don’t know if this is possible. I’m torn because I’m aware that studying with Geshe-la, as I’m doing now, is a very fragile fortune. Sooner or later we all will go back to our countries and learn to be stronger and more self-reliant than we expected. Perhaps the need to be our own islands is there as Western sangha, no matter which level of ordination we take and with which tradition. I don’t know. I’m a little confused. Geshe Jampa Gyatso’s advice was excellent. If you proceed slowly, study the bhikshuni precepts, and examine the various issues involved in taking them, then when you do ordain, you’ll be clear and confident. In terms of preparing for the ordination, I recommend studying the precepts. Read Sisters in Solitude, Choosing Simplicity, and Blossoms of the Dharma. The Chinese tradition usually has a one or two month ordination program during which the bhikshuni ordination occurs. Attend the whole program. It’s very valuable. The Chinese, Korean, and Vietnamese ordination lineage is the Dharmaguptaka; the Tibetan is the Mulasravastivadin. They aren’t contradictory. All these lineages are pure and valid. Vinaya lineage concerns our monastic vows. It does not indicate which Buddhist tradition we follow or which philosophical tenet system we adhere to. I haven’t found any problem in being ordained in the Dharmaguptaka Vinaya tradition from China and practicing Tibetan Buddhism. Most of the nuns of the Tibetan tradition who take bhikshuni ordination—whether from the Chinese, Korean, or Vietnamese sangha—continue to wear Tibetan robes and do their Tibetan practice. I only know of two who decided to wear Chinese robes and practice in that tradition after ordaining. Personally speaking, I feel very comfortable in Chinese temples and with their practice due to what I learned during and after my ordination program. I feel more like an “international Buddhist,” although I mainly practice in one tradition. In Chinese Buddhism, as in Tibetan Buddhism, masters often send their disciples to a more respected master (a “high lama”) for ordination. While the ordination master is officially our abbot, our original master remains the prominent one who trains and guides us in the Dharma. Of course learning the language and customs would be wonderful and would afford you the most access to the Chinese Vinaya and training in a Chinese monastery (similarly with learning Korean and Vietnamese and training in their monasteries). However, you can usually find a monastery where some nuns speak English and if you stay there, the master will appoint one or two of them to help you. It’s nice to do that at least for a few months to get the feeling of the bhikshuni sangha, which is very precious. Then you can return to your Tibetan masters and Tibetan studies. 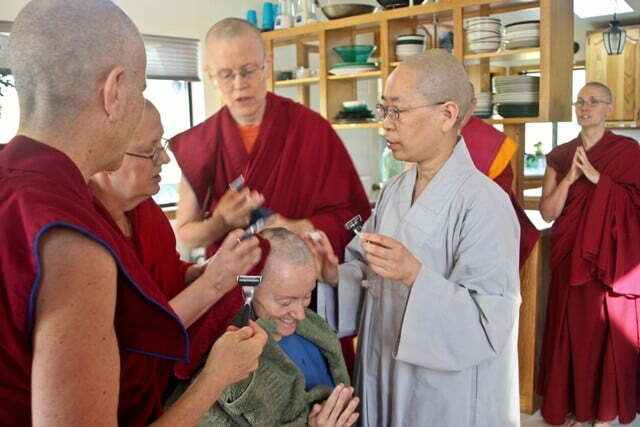 Yes, we Western sangha have to learn to be self-reliant and strong internally in order to keep our precepts. We also have to learn how to be part of a community and to give up constantly focusing on MY Dharma practice and what’s best for MY path to enlightenment. Internally strong and confident monastics, who know how to love, share, take care of, and support each other—it’s a tall call but how wonderful and beneficial it will be to become like that.